Shown here is the Beta Rubber Sub mount assembly.THIS IS THE MOUNTING KIT ONLY, EVERYTHING APART FROM THE STABILISER RRP 031. 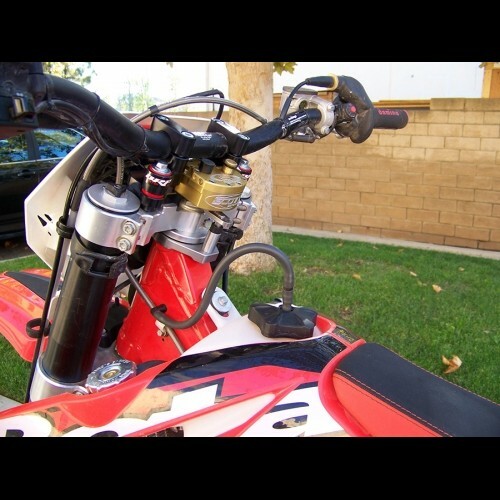 SUB" mount stands for Stabilizer Under Bars, originally designed for raising the bars. These kits are designed for use with Oversize bars. This concept allows more room for other equipment such as, Global Positioning Systems(GPS) or Enduro/Rally computers and yet still retain the quick access for adjusting the stabilizer. This is also good for the taller rider who wants his bars a little higher, as it raises the bar location approximately 11-25mm, depending on the model of bike. In some cases, you might consider a lower bend handlebar bend at the same time, unless you are trying to achieve a higher bar height along with your stabilizer installation. The SUB mounts are only available on certain models based on the physical limitations of mounting in this area. Each SUB mount comes complete with all necessary parts, hardware and "Step by Step" pictured instructions. If you have any questions, feel free to call or email us. The Photo attached here may be a generic photo to show you the basic components in the kit, but may not be showing the exact kit for your specific bike. NOT SUPPLIED WITH SCOTTS STEERING DAMPER (RRP031) AVAILABLE SEPERATELY. REQUIRES LINK ARM +8MM FOR STEERING DAMPER, INCLUDED IN THIS KIT.